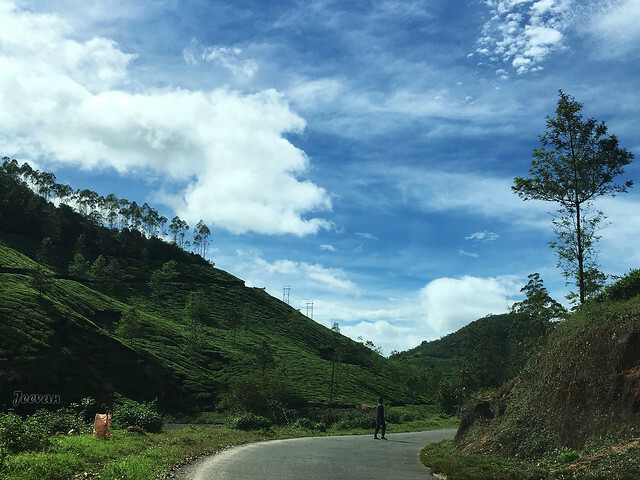 Before checking the Tea Museum in Munnar, I captured this lovely shot on the pretty sky raised above the mountains of tea. Interestingly this’s the only part of the blue sky I watched during the entire trip of Munnar in Nov 2017! I ever experienced a travel like that where the whole trip went under gloomy, cloudy and rainy atmosphere and treated with multiple waterfalls decorating the mountains like festoons. I really forget that I have completed 13 years in blogging on June 20th. I’m certain it’s only because of you, friends, support that I continue to blog and your comments were my booster to kept spring here. Thank you all. 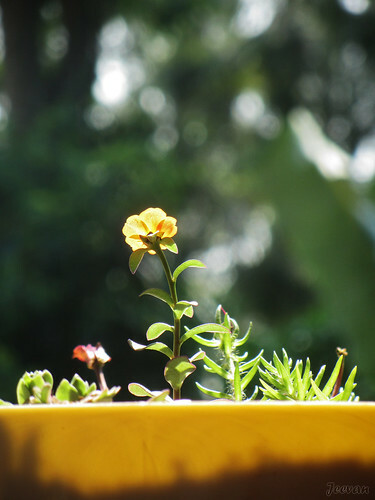 Blogging is a celebration every day and in the long run that particular day doesn’t mattered anymore and blogging isn’t the same as well when I begin and the experience of blogging taught me a lot to apply in my life and track changer as well. It’s all because of you and you created a path for me to walk through. Tamil Nadu Chief Minister has taken oath in assembly to lay green road to Salem from Chennai, an 8 lane expressway through Tiruvannamalai-Harur. I really think is there a real need to execute this 8 lane project on the already 2 lane state highway? Anyone who has travelled this road would know how beautiful and scenic the entire stretch was with farmlands, reserve forests and mountainous landscape with number of trees lining up the road makes it a pleasant driving. 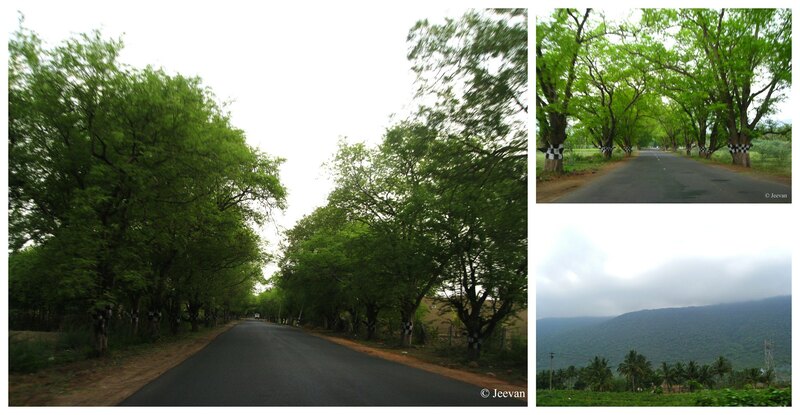 I have travelled on this road to (to and fro) Yercaud and I enjoyed it both the ways to become my favourite. 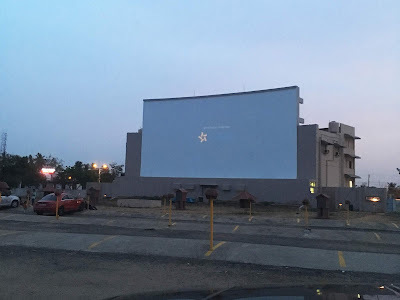 I really disturbed hearing this project and thought its quite waste of money and destruction of nature and environment… there’s already couple of national highway connecting Salem with Chennai and they were also 4 lane but this 8 lane roadway is unnecessary and that too the selection of this route is wrong. There aren’t many significant industries on this section and the need for transportation is also less and most part of this stretch is dedicated to farming and has certain amount of Eastern Ghats and five reserve forests on its way which is in need of production. 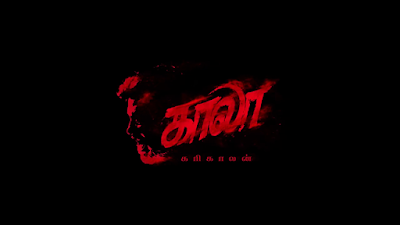 The prime road to Salem from Chennai through Kallakurichi isn’t much busy and only 40% of vehicles use this road and that road too needs improvement as it wasn’t good in shape and smooth at some places and turns from 4 to 2 lanes at the bypasses. To make people irritate there are toll gates for even short distances. First these things have to rectify before they go creating a new section of road where there isn’t need for such fast pace 8 lane expressways. 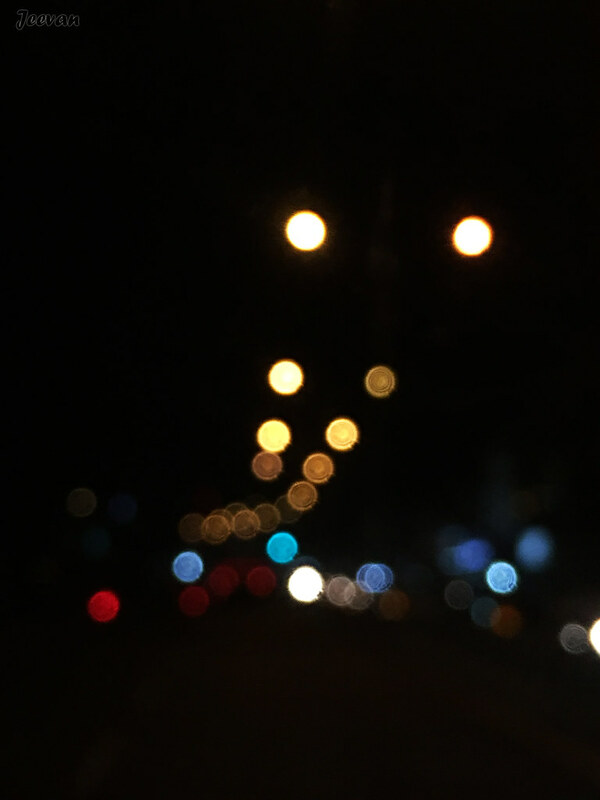 Even though they make it with a long time vision, at what cost matters lot? Destroying the environment and nature, forest and farming which upholds our life and make certain we live. What kind of development are we taking ahead or presenting to our future generation is to inhale dust and smoke. Forests and trees are our air purifies and if we lose these filters how could we breathe healthy? Any development that destroys nature and environment should be prevented as much possible. A part of ghats section and reserve forest the govt. want to destruct. 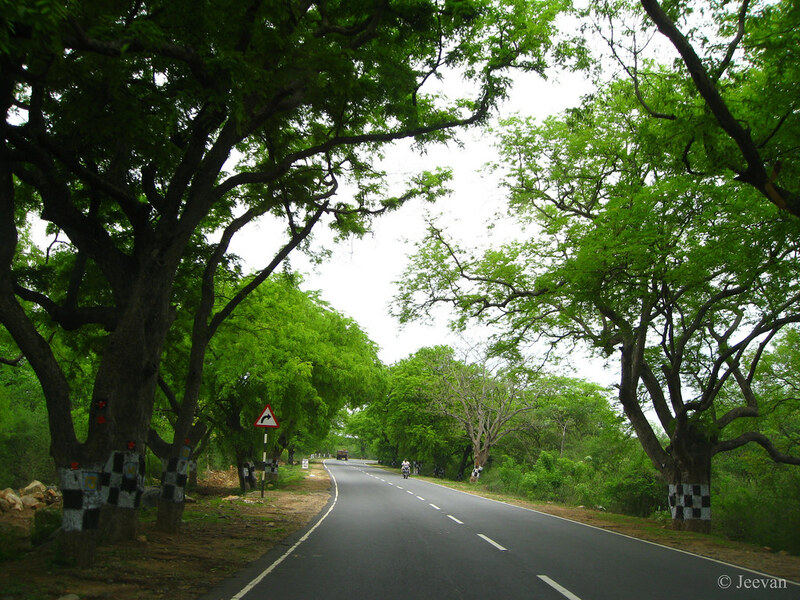 The other important roads like Tindivanam to Tiruvannamalai and Villupuram to Thanjavur were still partially done. For every New Moon lakhs of devotees visit Tiruvannamalaai for Kirivalam (Circumambulation of the mountain) which means thousands of vehicles and buses take the Tindivanam road which is in bad state because of abandoned road work for many years. I wonder why the CM is serious about this project when a lot of problems, which need immediate actions, are pending on… 8 lanes for this stretch of road only gives doubts. 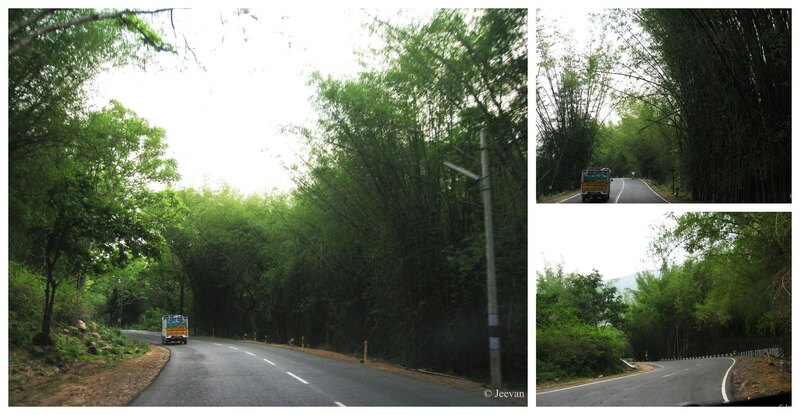 Not more than a decade back highways has lot of trees along the roadside but they were all cut down for the widening 4 lane roads and no trees were re-planted as promised by authorities and our highways on all side are bare enough now. Stopping the car even for an emergency on the roadside is difficult these days without a tree for shadow. Though Salem was his region doesn’t mean he has to execute this project that only destroys farm and forest landscape. We are in need of more green space and forestry to preserve our rain sources as we are inadequate of water, bringing the Cauvery should be our prior and preserving the environment is much. The already enriched green road and what better the government could do on it? 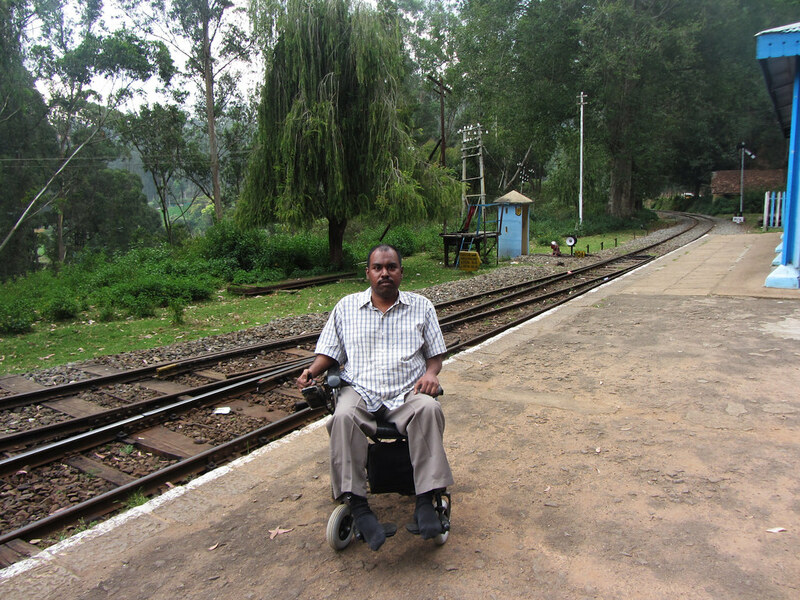 It’s not easy for a wheelchair bound to board a train and traveling in a mountain railway is out of dreams but I always wish to visit at least a railway station of the century old Nilgiri Mountain Railway. 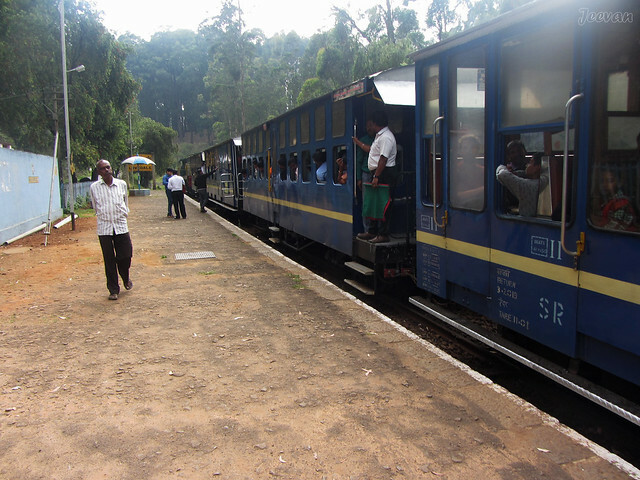 Many movies have captured the beauty of the Nilgiri Mountain Railway and its picture postcard railway stations and smoky stream engines chugging out of the stations and making journeys through scenic mountains. Lovedale is a popular location for the climax scene in Tamil hit film Moonram Pirai. 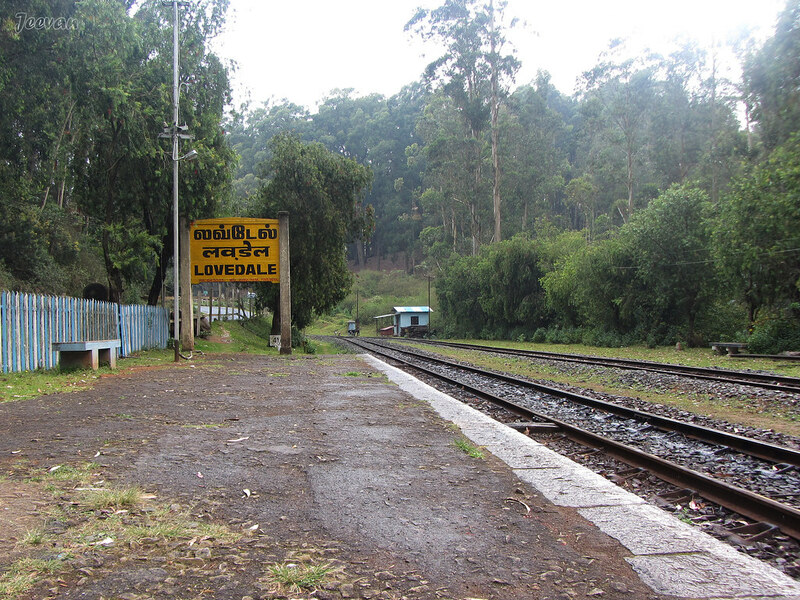 Last time when I visit Nilgiris in April 2017, I was intent to check any of the railway stations of the Nilgiri Mountain Railway and Lovedale was my prior. 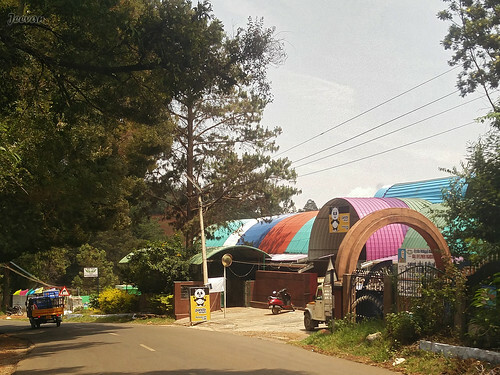 As I took an unusual road to Ooty, I passed Lovedale before entering the town and found it wasn’t far away from the town, so we passed without stopped there with a plan to return later leisure. Making it certain, the cottage we stayed was close to the Lovedale and opposite to the road leading there from the Ooty-Coonoor main road. We stayed at a place called Fun City, on the outskirt of Ooty and it is a place formerly seems to be an amusement park which later turned into property development and many cottages and homestay keeps emerging out there. Lovedale is just 6 minute drive from there and it was almost afternoon when we checked the lovely (Lovedale) railway station. Yours truly waiting for his train haha.. I had no idea about the timing of the train’s arrival and passing the station but we learned only after we reached there that this was the time of the arrival of a diesel engine with passengers from Ooty. Actually we packed the lunch when moved out of the homestay and wanted to make to the railway station after having the lunch, when we already parked at the station parking. It was 1.30 pm and the station guard told the train will arrive in 10 minutes, so we postponed the lunch and waited for the train. Meanwhile I took some lovely photos around the station where we are the only visitors and various aspects of the station attracted me. 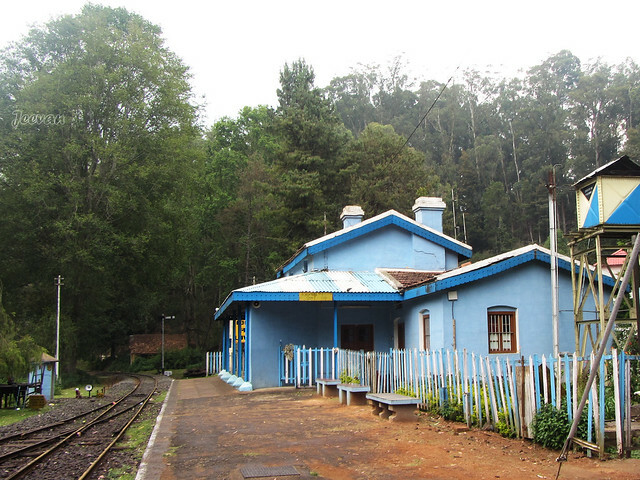 Lovedale, like all other Nilgiri railway stations, continue to operate from its original structure and it shares similar architecture as well. 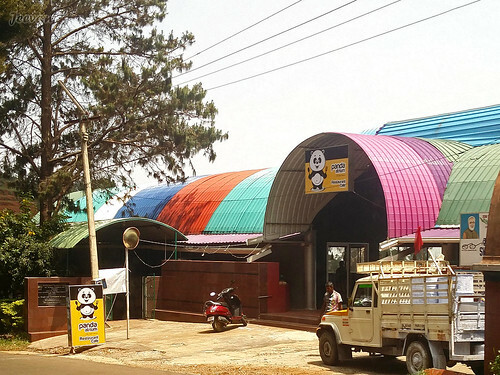 Coonoon being the junction railway station and Ooty as important and final destination on the mountain journey comes up with big operation rooms and passenger hub. But Lovedale is a passing railway station and only local people seems to board on and off and sometime tourist get down and take some snaps while the train halt for few minutes there. 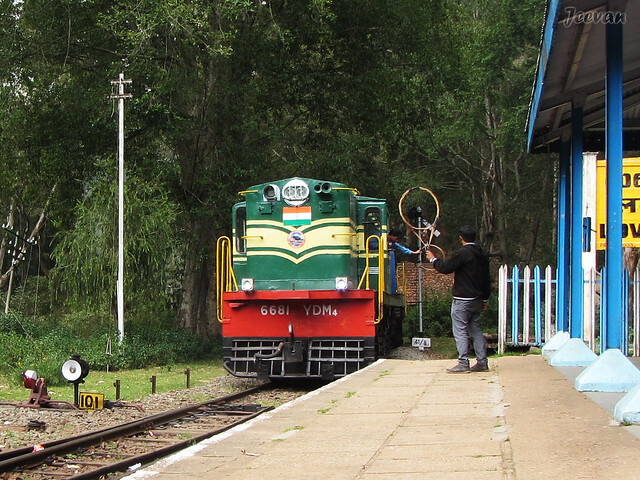 I actually thought the entire Nilgiri mountain railway (runs for 46 km) has turned into diesel locomotive but what I really don’t know was the stream engines are in continuous operation between Mettupalayam and Coonoor and only further upstream to Ooty (18km) is operated on diesel. The train entered the station at 1.50 pm and moved exactly after 2 minutes halt and the train was fully loaded with passengers. As I was excited taking photos on the emerging/halted train, the passengers were curious watching me, taking photos from the wheelchair. When the train enters the platform the station guard exchange the rings (which looked like a wireless tennis bat) with the driver, which I Google to know is a “railway signalling process and the ring is a token, a locomotive driver is required to have or see before entering onto a particular section of single track”. In the picture above u could see the guards ready to exchange the rings, but the driver dropped the ring on the platform and took the ring from the station guard and it’s perhaps due to the speed. As soon the train moved out of the station, the guard went up a small platform on the opposite side and changed the track gear. In short time it started to drizzle and the entire ambiance turn wonderful and much lovely and I really enjoyed the moment from the station porch, where I found couple of house sparrows making way through the portico. 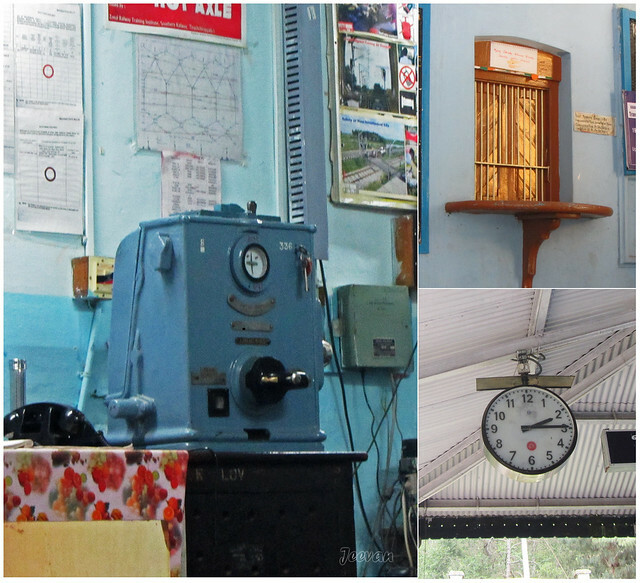 Though I hesitate to look into the station master room, through the open door I able to capture the token instrument placed on the table along an old telephone. The Nilgiri mountain railway began its construction in 1886 completed in 1908 with the building of track between Coonoor and Ooty, where Lovedale is interlinked. 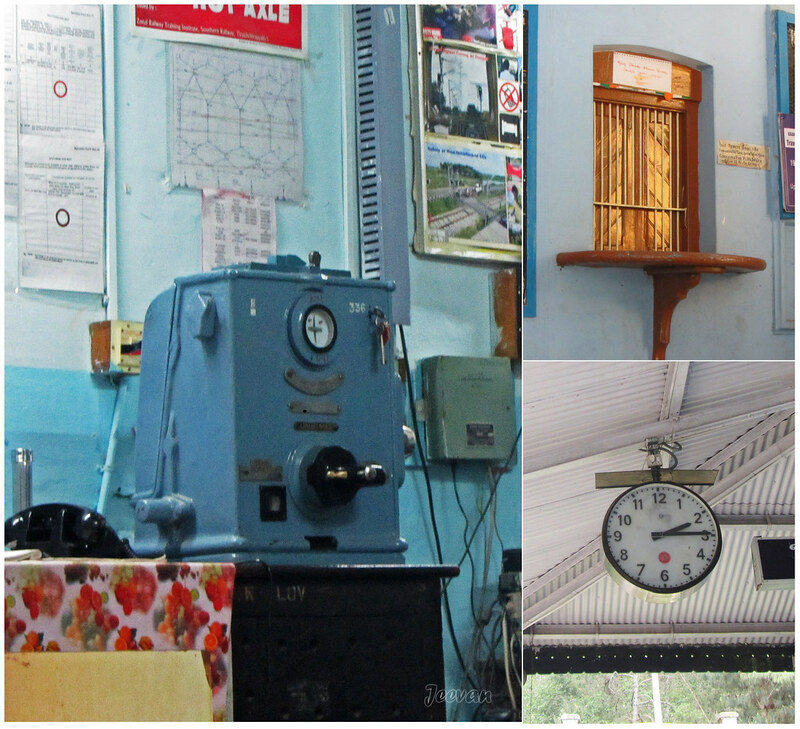 The old token instrument and dial phone, the wooden ticket counter in booking room & hanging clock from the porch roof of the railway station.